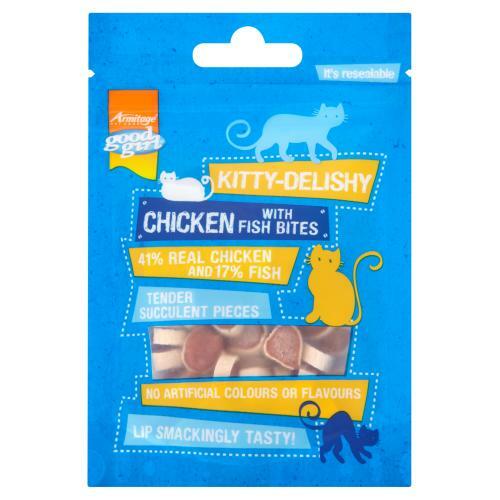 These deliciously moreish Good Girl cat treats are tempting succulent bites which your cat will love. Made without any artificial colours or flavours these hypoallergenic making then sensitive to cats who in the may have suffered from digestive problems. Suitable for Cats and Kittens from 4 months old you will find yourself having to hide these treats from wondering paws. Ingredients: Meat and animal derivatives (41% chicken), derivatives of vegetable origin, fish & fish derivatives (17% pollock), cereals, eggs and egg derivatives, various sugars and minerals.